Subject:- Condonation of deficiency in service for grant of 2nd service pension in respect of DSC (Defence Security Corps) personnel. Reference:-This office Circular No. 387 dated 23.06.2008. A copy of GoI, MoD letter No. 14(02)/2011-D (Pen/Pol) dated 20.06.2017, on the subject which is self-explanatory is forwarded herewith for information and necessary action. 2- The Government has clarified vide para 2 of ibid letter that condonation of deficiency in service is to be accorded on merit and in the deserving cases to make individual eligible for at least one service pension. Condonation of deficiency in qualifying service for grant of 2nd Service pension in respect of DSC personnel has no merit. 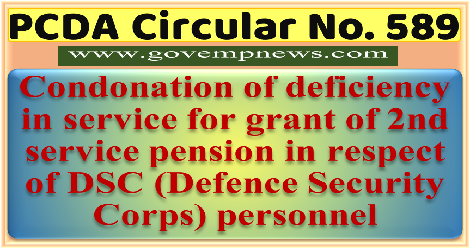 Therefore, no condonation shall be allowed for grant of second service pension in respect of DSC personnel. 3- It is therefore, advised that henceforth the laid down rules may be scrupulously adhered to for earning pension and condone shortfall strictly where merited. 4- This circular has been uploaded on PCDA (P) website www.pcdapension.nic.in.